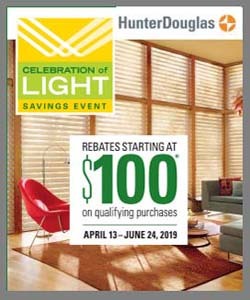 If you’ve shopped at Windows, Walls, & More serving West Bloomfield before, you’re probably aware that we carry the full line of Hunter Douglas window fashions and can meet all of your window treatment needs. Backed by a Lifetime Warranty and the Right Choice Promise™ you’ll have peace of mind when you invest in Hunter Douglas Window Treatments and that your product will be custom made for your specific needs and built to last. Whether you are in the market for window treatments for bedrooms, bathrooms, or basements, we have you covered. We also carry Hunter Douglas products for all window shapes and sizes, ranging from small windows to large walls of windows. If you’re in the market for new window treatments for any room or any window in your home, talk with our professional staff today! Do you have an odd-shaped window that needs to be covered, but you don’t know what window treatment would best fit? Hunter Douglas offers solutions for practically any window in your home. Start by asking yourself why you want or need to cover the window. Do you want to control light, provide privacy, and/or enhance your décor? Once you understand why you want to cover your window, our professional staff can inspire you with an array of styles, colors, and options that will not only take care of your needs but stay within your budget constraints too. Installing windows that add drama and excitement to the home is the current trend in new construction. Although beautiful, these windows come with their own particular set of challenges, including fashioning those windows. Read on for some of the most common specialty shaped windows and our window treatment solutions. Skylights. Skylights add light from above when typical windows are not an option. These windows provide a beautiful shower of light into any room when opened or closed. The Honeycomb shade is a great choice for skylights and offers both blackout and light-filtering options. 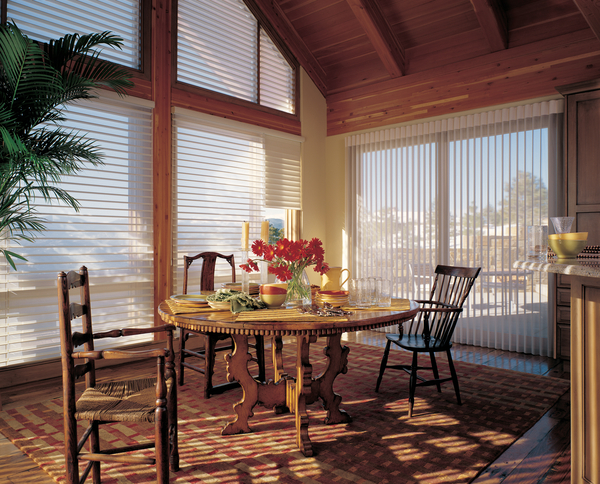 Our favorite option is the Duette® Honeycomb Shades. Angles, Arches, Circles, and More. Arches, angles, and circles are always a show stopper because of the unique shape and light each provides. 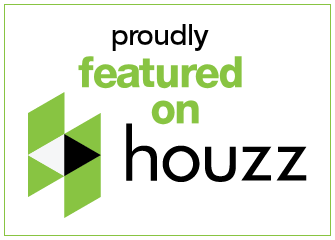 Our favorite window coverings for these widnows, include, NewStyle® Hybrid Shutters, Duette® Honeycomb Shades, and Pirouette® Window Shadings. Depending on the window and window covering, you may want to consider adding PowerView® Motorization. Not only is it a great option for hard-to-reach windows, but it also adds a level of security to the home.